Even casual followers of Kansas high school football over the past two decades would typically associate Gardner-Edgerton and Salina Central among the state’s top programs. You may remember guys like Bubba Starling and Traevohn Wrench starring for the Blazers, or Jake Shape and Donnie Anders for the Mustangs. However, a more short-termed memory shows two programs trying to rebound from tough times. Salina Central enters the 2018 season having lost 18 consecutive game, while Gardner-Edgerton has dropped its last ten games. Both schools are breaking in new coaches this season. Gardner-Edgerton has hired Ryan Cornelsen to take over for Marvin Deiner – who had so much success at Salina Central before making the switch to suburban Kansas City. Meanwhile, Mark Sandbo is the first-year head coach at Salina Central. Gardner-Edgerton faced an uphill battle competing in the Eastern Kansas League and has made the move to the Sunflower League. The Blazers open up against state-ranked Shawnee Mission East, a team they’ve given fits early in the playoffs in each of the past two seasons. Salina Central remains in the Ark Valley Chisholm Trail league and has a schedule loaded with traditional powers and programs on the rise. The Mustangs open up with Goddard-Eisenhower; a team with several returning starters and among the top 10 in Class 5A. 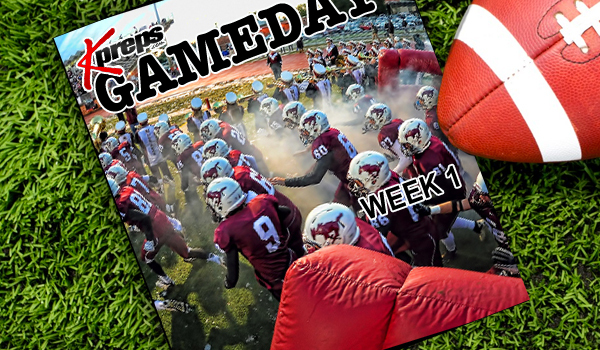 In Week 2, Salina Central travels to Class 6A’s top-ranked team in Derby. While both schools should be much improved this season, only time will tell if that improvement results in success in the win column. The Oswego Indians make the transition to 8-Man football this season and open with a short 10-mile trip to take on long-time rival Chetopa. The game has been referred to the Battle of the Boody Bucket referring to a bucket of towels soaked in sweat, dirt, and blood that one opposing team mistakenly left behind on their sideline in the 1950s (no one seems to remember which team). When that opposing school called to ask for the return of their bucket, the hosting school replied that they would have “earn it” back on the playing field. For a long time, the winning school retained a wooden bucket carved with the result of each year’s game from 1954 to 1987.The bucket was cut in half in the late 1980’s when Chetopa switched to 8-man football with each school retaining half. The schools have met since in the late 90s, but will renew their rivalry now that Oswego has switched to 8-man football. The Indians have high hopes now that they welcome in accomplished 8-man coach Matt Fowler. After a highly successful run at Spearville, Fowler accepted the head coaching job at Oswego which is less than 80 miles from his hometown of Lockwood, Missouri. Fowler led Spearville to a 62-32 record, the 2015 8M-I state championship, and four consecutive seasons of double-digit wins. In addition to Oswego, several other teams will make their 8-man debut after moving from 11-man football. Doniphan West will take on Washington County in a game featuring a pair of 8-Man newcomers. In addition, Medicine Lodge, Moundridge, Maranatha Academy, and Chase County. Taking full advantage of open scheduling, three Class 5A schools will travel out of state for Week 1 games. Liberal travels across the state line to Guymon (Okla.) as does KC Sumner Academy to take on Plattsburg (Mo.). The Schlagle Stallions will travel quite a bit further. Schlagle will travel south of Fort Worth, more 550 miles, to take on Burelson (Texas). The Olathe West Owls, the state’s newest school, will debut its varsity football program at home against Class 6A No. 2 Lawrence Free State. Olathe West began with a junior varsity schedule in 2017, but will open varsity competition this fall. Former Mill Valley assistant T. J. O’Neill is the Owls’ first coach. O’Neill, a Salina Central graduate, has been part of back-to-back Class 5A state championships as Mill Valley’s offensive coordinator in 2015 and 2016. The Wichita City League title will be on the line when top-ranked Wichita Northwest travels to defending Class 5A state champion, No. 3 Bishop Carroll. The Grizzlies and Golden Eagles met to open the 2017 season with Carroll scoring a touchdown in the final 11 seconds to win 40-35. De Soto will travel to Leavenworth in the inaugural league game of the newly formed United Kansas Conference. In addition to the Wildcats and Pioneers, other members of the new UKC include, Basehor-Linwood, KC Turner, Lansing, and Shawnee Heights. Ark City will host rival Winfield in another edition of the Cowley Cup. Ark City leads the all-time series 51-24-1. The Bulldogs and Vikings open the season against one another for the first time since the 2014 and 2015 seasons. The Ulysses Tigers will return to the field for the first time since the sudden passing of head coach Jason Kinney. Kinney passed away on July 24th after 24 seasons leading the Tigers to 135 victories. The Tiger’s traditionally all-black helmets will include a “Coach Kenny” helmet sticker this season. Long-time assistant Rick Due will serve as interim coach this season. Eureka opens the season at Leon-Bluestem in what will be the closest-to-home game on the Tornadoes schedule. Eureka announced they will play all games on the road this season after their home stadium sustained damage from a tornado that hit the town in late June. Atwood-Rawlins County opens against Hitchcock County (Nebr.) – Why is this significant? Long-time Kansas coach Randall Rath is in his first season as head coach at Hitchcock County (Nebr.) after leaving Hays High last season. Rath, the longtime Oakley head coach. Rath spent more than 20 years at Oakley in various roles, mainly head football and head girls’ basketball coach. Oakley is a former Northwest Kansas League foe of Atwood. After his time at Oakley, Rath coached one year at Cimarron and the last three at Hays. Rath is from St. Francis and has grown children living in Nebraska. He enjoyed much success in his career against Atwood, including a 7-1 record from ’07-11. The teams often matched up in the regular season and then again in the playoffs. The Central Prairie League has annually featured multiple ranked eight-man teams, such as Central Plains, Victoria and Otis-Bison. Ness City and Macksville also reached the playoffs last fall. Generally, La Crosse is the lone 11-man school and has trouble scheduling. This year, Ellinwood transferred back up to 11-man and will play in the 2A ranks, while La Crosse is one of the smallest 1A schools. It marks the first time any La Crosse player has faced a league school in football. Ellinwood (2-7 in ’17) plays host to La Crosse (6-4). This marks the first matchup between the two teams since 2013. La Crosse won eight in a row in the series from ’06-13. Ellinwood joined the Central Prairie League for football starting in ’14. La Crosse has the smallest roster under 10th-year head coach Jon Webster and returns junior quarterback Hunter Morgan. The Leopards were expected to have around 20 players. Ellinwood finished 2-7 in the first season under Alex Birney last fall. Also in the CPL, a key Eight-Man, Division I game occurs between Central Plains and Ness City. Central Plains and Hoxie headline a deep classification. Ness City is 7-3 and 5-5 the last two falls with back-to-back playoff berths. Both teams return multiple key players, including Oiler quarterback Myles Menges and Ness City signal caller John Pfannenstiel. Ness City averaged 37 points a contest last year but permitted 34. The Eagles had a massive comeback against a 7-2 Satanta squad in district that essentially clinched a playoff berth. Central Plains, a consistent power and 9-2 team in ’17, again ranked among the top teams in offense and defense with an average margin of 48-11. This game presents an important litmus test for both squads. In the last five years, Central Plains has lost just seven games. Three came to Spearville in the second round of the playoffs and three others came against Victoria, including a season-opening loss to the Knights last year. Central Plains was No. 1-ranked, while the Knights were unranked. Central Plains is 3-0 against Ness City in the last four years with 32-0, 54-8 and 44-20 victories. Ness City can prove it’s among the top contenders in Division I by closing the gap against the Oilers. In early summer, Elkhart coach Chris Hattabaugh admitted he hadn’t really studied the new playoff system or 1A as a whole. The Wildcats, 8-3 in ’17, are a state contender and have arguably the most talented roster in school history after the school’s fourth playoff win last fall. First team all-state quarterback Lane Whisennand headlines the team. Instead, Hattabaugh was focused on the Wildcats’ season-opening game versus Cimarron, hovering just outside the top-5 in Class 2A. The Bluejays went 7-3 last fall, and have multiple key players returning for coach Greg Koenig. Sophomore running back Tate Seabolt is primed for a big year under Koenig, long known for his prolific running offenses. Since ’04, Cimarron is 10-4 against Elkhart, including four straight victories. Last season, with Hi-Plains League ramifications on the line, the Bluejays defeated Elkhart, 30-6. Elkhart then struggled against Smith Center’s run-based attack later in the playoffs. Before last year, the three previous meetings between Cimarron and Elkhart went 50-0, 52-14 and 35-13 in favor of Cimarron. Friday will provide an early barometer on the Hi-Plains and 1A/2A classifications. The Saline County rivals match up in Week 1, the first time the teams have played against each other in the season opener since 2015. The last two seasons, the contest came in Week 4. Southeast of Saline holds a 10-4 advantage since ’04 and has won the last four meetings. However, the last two have been close with 24-14 and 44-41 victories. Both squads look for improvement in 2018. Southeast of Saline has a bevy of defensive starters back from a 4-5 squad, though standout lineman Dylan Marks is expected to miss the game. Linebacker Rudy Rodriguez had a key interception in last year’s win. Sacred Heart went 2-7 but had three losses by a combined 21 points. Sedan and St. Paul was in the same district the last two years. Two years ago, Sedan beat St. Paul, though the Indians still won the district. Last year, St. Paul lost the district to West Elk and then made a run to Division I state championship game. This year, St. Paul transitions down to Division II. The last two years marked the only times the teams have played each other since at least ’04. Sedan won 50-40 in ’16, and St. Paul captured a 37-18 victory last fall. Both teams return a productive running back, though one is more well-known than the other. For Sedan, Cody Joslin was moved to running back last summer after he didn’t play football his first two years. He rushed for 1,013 yards and 13 scores. Junior Tayte Halderman returns after picked off nine passes, among the state’s best. St. Paul had significant graduation losses but has junior running back Adam Albertini, one of eight-man’s top returners and more high-profile players after he cleared more than 900 rushing yards in an injury-plagued season. Congratulations to Scott Moshier and the Wichita North Redskins. On Thursday night, North defeated Wichita South 29-22 to snap a 21-game losing streak. Prior to last night, the Redskins last victory came October 15, 2015 in a 22-5 win over Wichita East. The victory takes Wichita North from the longest losing streak in Class 6A to now tied for the longest win streak – 1 game.